As my previous post said, I spent my last summer holiday at Europe with my friends. We took quite a lot of rolls and finally got some good accidental shots, at least I believed. 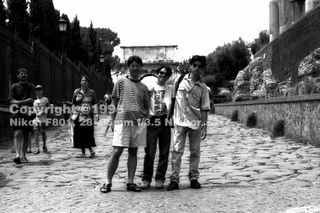 One of them, I ever love one, was taken at Rome with my friends by black & white film; my first B&W. I cannot explain why I love this picture so badly that I find no other pictures better than this - Chung, Henry, me and the photographer, Stephen. It's a really good photo. I like it! It has "mood"!! !